Все мои тесты еше закончены. Я рад но еше имею 2 эссе. Я буду продолжаться учиться русский-язык. Я люблю русский язык! Вчера я шел в караоке (с моими друзьями= мои други). Я не пою хорошо но все мои друзья поют хорошо. В завтра тест. Надо учиться! Я тоже имею руский тест в четверг. С Рождеством! Что вы делали на Рождестве? Вы ходили на вечеринку? Или вы ничего не делали? Я вышел с русская подруга и мы выпили кофе. Интересно говорить по-русский! 메리 크리스마스!! 여러분은 오늘 뭘 하셨어요? 놀러 갔어요? 집에서 잤어요? 전 러시아인 친구 하고 커피를 마셨다. 그냥 커피 마시다가 저에게 러시아어를 가르쳐 졌다. 이 학기 러시아어 수업을 든데 수업에서 러시아어를 말하는 기회가 전혀 없는 거다. 그래서 말하고 싶어서 크리스마스 라고 이런 일에 할 건 없어서 러시아인 친구를 권했다. 여러가지 재미있는 걸 가르쳐 져서 즐거웠다. Feliz Navidad! ¿Cómo pasaron ustedes este día? ¿Salieron con sus amigos, o se quedaron en casa? Yo salí con una amiga russo y bebimos cafe mientras me enseñaba el russo. Aunque estudio el russo en la universidad, no hablamos en la clase, sólo escuchar lo que habla el profesor. Las clases del russo son muy aburridos siempre y lo más malo es que no puedo hablar el russo bien aunque lo estudie yo 3 meses ya. Nos hablamos 2 o 3 horas hoy y creo que aprendí más russo que la clase. Qué fracaso. Espero que mejora mi russo rápidamente para que pueda hablarlo con ella en el russo pronto. And so, merry christmas, everyone =) Despite the rather pessimistic entries of recent, my christmas has been pretty decent. Christmas is just another day, not that significant, they tell me. But they all are singles in self-denial, holding a common sentiment. Tokyo is an excellent place to celebrate christmas, minus all the crowds. Beautiful are the illumination, the decorations and the people, but not so the screeches, the bumps and the shouts. Mingling in the crowds, watching people walk by is never really a bore, but standing alone in the crowd you should never expect more, because every step you take you bump into someone, and when you step right out of it you are granted your muscles sore. Having no plans for the big day I stayed at home sulking. Until I found a friend free, a friend I had been seeking. So off we went onto the streets and in Russian she started speaking. She taught me Russian and we had lots of fun before the clock started ticking. Alas, language exchange on Christmas, what the heck was I thinking? But well perhaps it is just one of my most unique and unforgettable Christmases in the making! And so this weird blog entry is coming to an end. And this weird Christmas too, with no presents nor cards to send. I had a decent Christmas though perhaps not as grand. I will leave you with some photos to enjoy, but that’s all, see you, till then! 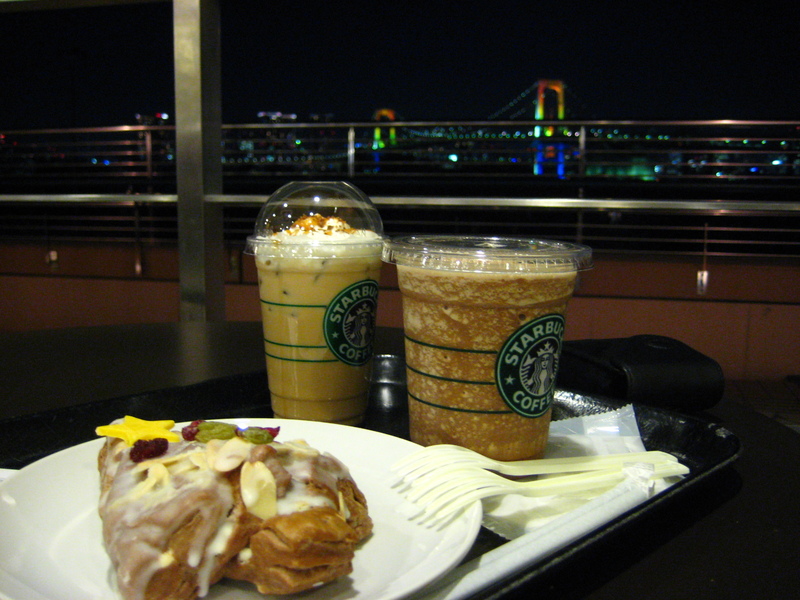 Starbucks Coffee with Rainbow Bridge in the background. 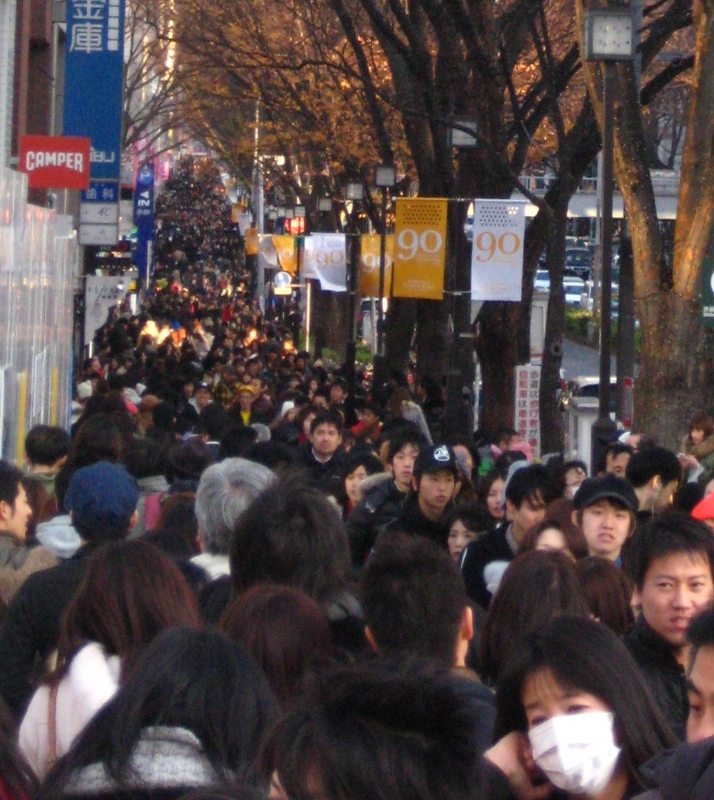 Look at the number of people on Omotesando. Unbelievable. сегодня холодно… здесь уже зима. я изцаю русский язык в унивесрситете но мы не поворим много в классе. я хочу поворить по-русски хорошо. я еду в Корею зимой. я изучаю русский язык теперы. оченъ интересно изучаты русский язык. I have only just started Russian for less than two months, so I can hardly form a sentence yet. Long way to go before I can start writing entries in Russian!